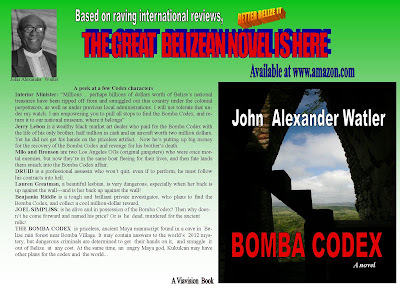 This is John Alexander Watler's newest novel. Get your copy now at Amazon.com. This is an absolute must read from one of Belize’s most prolific novelist and storyteller. Those fortunate souls living in the Chicago area can catch his act weekly somewhere in the State of Illinois. For those who live continents away, Bomba Codex will keep you on the edge of your seat wondering what Druid will do next or who the curvaceous Laura Greatman will seduce tonight. The story takes one on a journey across at least four continents and somehow, as you’d imagine, Hollywood, Los Angeles, Houston and other major American cities become the backdrop for a variety of human interactions involving greed, drugs, the inevitable murders and tons of cash. Every field of endeavor has a person at the very top who defines that genre – Michael Jackson, Michael Jordan and Michelangelo quickly come to mind. John Watler has that same indefinable quality that’s so difficult to characterize in the literary field and reading his novels is the only way I know how to appreciate this rare talent. I’m willing to bet the folks at Amazon would agree with me and sooner or later so will you. Go get your copy – it’ll make a great Christmas gift indeed.